Building up what looks like a meta-thesis re: the ancient Near Eastern origins of biblical monotheism, Mark Smith turns with a strong hand to the question of empire. God in Translation: Deities in Cross-Cultural Discourse in the Biblical World is two things at once:  a careful look at ancient Near Eastern contexts and  a sharp, even polemical intervention in the monotheism debates sparked by scholar-critics like Jan Assmann and Regina Schwartz. 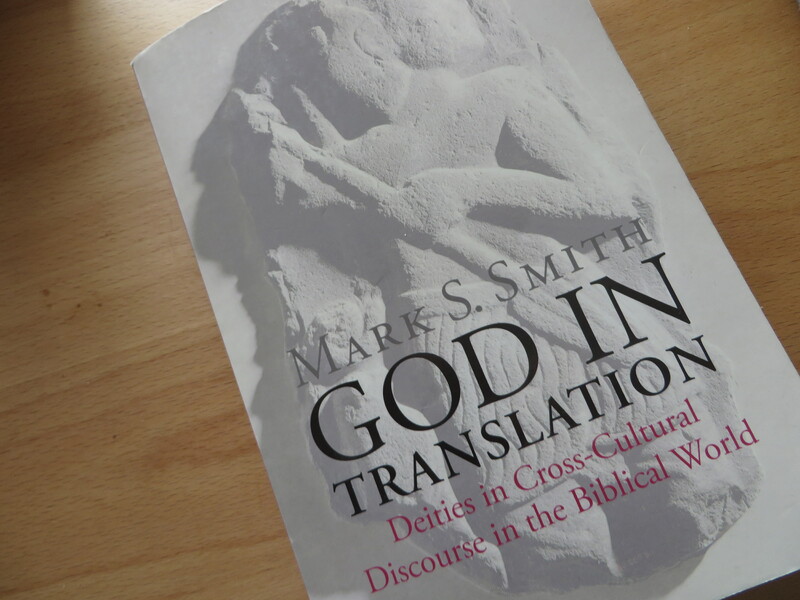 At the heart of the book is the way Smith picks up and refines what Jan Assmann called the “translation” between gods. Smith understands it as a regional dynamic, particularly as a Late Bronze Age phenomenon, including contemporaneous biblical material. By translation, Smith mostly means the mutual recognition by one group (i.e. “nation”) of another group’s gods, the power of those other gods, and the efficacy of the rites devoted to them. Examples from the Bible are drawn from the books of Judges and Kings reflecting the religious cultural politics of the early monarchical period. Across the region, the gods no longer translate with the rise of the large international powers, Assyria and Babylonia. First, Smith notes the emergence of a 1-God theology in Mesopotamia that he calls “summodeism.” The term is taken from Eric Voegelin to refer to a “theism in which the deities are regarded as aspects or functions of a chief god, with political power often key to its expression” (p.169). Examples would include Assur and Marduk. From the bottom side of empire, exclusive monotheism emerges in ancient Israel not as phenomenon of empire, but as a local reaction to and resistance by subaltern elites against the hard and soft power of Assyrian and Babylonian empire. Regarding it’s own claim to universal authority, Smith calls the 1-God YHWH cult a “form of notional imperialism on the part of a people with no claim or capacity to imperialism on its own” (p.225). For those of us interested in the monotheism debates, Smith’s intervention is a useful reminder as to the use to which history should be put in relation to theoretical debates, here in the study of religion. The polemical and apologetic takeaway is that ancient translation reflects power, not tolerance, and that violence is not unique to biblical monotheism. Smith’s study shifts these arguments away from abstract, historically disembodied conceptual frames of reference. That monotheism can emerge at a later date as a function of empire remains its own but separate problem. It represents a historical truth, not a necessary one in relation to some violent essence that allegedly defines monotheism as a concept. The basis for Christian empire from the biblical record would have to have already been ripped out of political context, reflecting radically new constellations of power in relation to the idea of God. Was there something fundamentally violent about the emergence of biblical monotheism? What wasn’t violent in the Iron Age? About Assmann I’ve had my own critical remarks here at the blog regarding the distinction he coined between “cosmotheism” and the “Mosaic distinction.” In contrast, Smith’s larger body of work shows the imbrication of ancient Israelite monotheism in its larger Near Eastern setting, particularly West Semitic and Mesopotamian contexts largely ignored by Assmann, who is an Egyptologist. Smith’s study helps us see why one might have thought so many years after deconstruction that these kinds of binaries no longer hold up to critical scrutiny. About the effect of God in Translation, I’m not so sure the intervention it represents will end the monotheism debates as much as set it on more even historical footing. Violence tends to slosh over such neat categorical distinctions, which is something many of us tend to lose sight of when it comes to arguments about religion. This entry was posted in uncategorized and tagged ancient Near East, Bible, God, religion, what i'm reading. Bookmark the permalink.